This is the African Hoepoe. 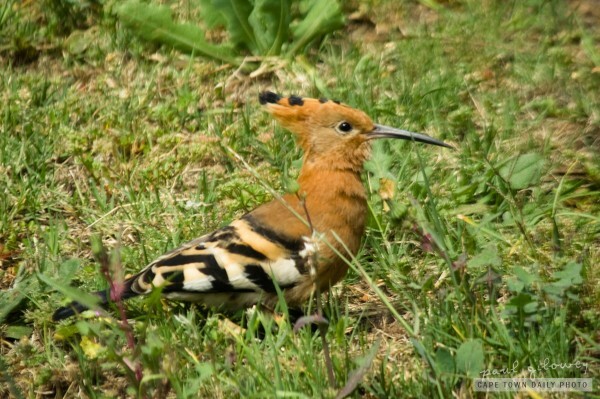 This Google image search reveals several photos of these and also of the Wood Hoepoe, a bird of considerably different appearance to the African Hoepoe. I thought all South Africans would recognise these. They are quite common up-country, but I admit to only seeing one or two in the 10 years since we moved down to the Cape so perhaps natives of the Cape are less likely to recognise these. But yes, I can confirm that this is the first time I’ve seen a Hoepoe in the Western Cape! Perhaps it’s all the Joburg-like weather we seem to be having. Thanks for the link Caroline. It looks like a great site! Just as well – they can be most foul according to a birding-mad friend of mine. Ali, the call you describe may belong to the Piet-my-vrou or Red-chested Cuckoo. Visit this site where you can listen to the call and that of many other local birds, including the Grey Go-away-bird you mention, which in Afrikaans is called the Kwe-voel after its call. Steve, YOU GOT IT!!! It IS the red-chested cuckoo. Thank you so much! !